You have heard about it, or you will hear about it, because this new approach to beauty will continue to develop and, therefore, needs to be defined. Like any category, when things begin to take on a palpable dimension, this need for definition becomes apparent. What does this term, which we meet more and more often, cover? Is it a new cosmetic as some would have you believe? The answer is no! There is only one cosmetic, as defined by the various regulatory texts, and, like dermocosmetics, Medicosmetics is only one segment, perhaps the most recent of this vast set that constitutes cosmetics. But he is very active. It has its press organs and, in France, its magazine, Antiâge magazine . He also has his grandmesses, like the AMWC (Anti-aging Medicine World Congress), which is experiencing growing success. Finally, it has its leading brands: Filorga, Teoxane, Re-Plasty by Helena Rubinstein (L'Oréal Group), etc. The major groups are also actively preparing to cover it with appropriate ranges. This positioning should not be confused with others around the traditional anti-aging approach. First of all, there is traditional cosmetics which is mainly based on prevention and the correction of the signs of age. On this observation, we distinguish, in"classic" cosmetics, dermocosmetics, which is the same cosmetic but practiced in the pharmaceutical industry. In the"traditional" approach to anti-aging, the idea is to prevent and correct by acting on the biological and physiological mechanisms involved in aging. There is also medical cosmetics, which are more oriented towards the treatment of skin disorders that may be pathological: acne, rosacea, ichthyosis, etc. Then there are the so-called"Doctor Brand". These are usually developed by beauty specialists, doctors or dermatologists, and offer care routines based on their knowledge or experience. Medietics was born in the development of anti-aging medicine. This phenomenon has been gradually established since the early 2000s and has continued to grow ever since. In this approach, the idea is to correct the effects of age through a series of non-surgical techniques, known as"age correction". 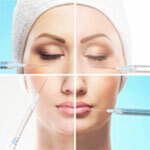 non surgical cosmetics procedures " . These practices have gradually become codified and constitute to date a specialty that occupies a whole part in the universe of beauty. The approach is not necessarily attached to a scientific or medical personality. In this approach, the main aim is to correct the consequences of age using precise techniques, but often based on the idea of compensation and stimulation. Chronologically, the first procedures were those of biostimulation using mesotherapy. Then, as filling products and toxin practices became widespread, procedures were organized around these original practices. At the basis of melesthetics, we will therefore find the initial techniques of anti-aging medicine aimed at the skin. - The gentle peeling, which is obtained rather classically by the use of acids (AHA, BHA), proteolytic enzymes (papain, bromelain), cocktails of these substances or traditional exfoliating agents. - Filling", which refers to the very wide use of hyaluronic acid in these techniques. It was already used in cosmetic specialties, but mainly as a moisturizing surfactant. Metaesthetics will generalize the use of hyaluronic acid and its derivatives, several of them having particular properties. Many products claim this technology. - The techniques known as"toxins" which are called in cosmetics"Botox Like" and which refer to the idea of using active principles, mainly of synthetic origin (peptides), having as mode of action the inhibition of SNAP, i.e. neuro-muscular transmission in the deep layers of the skin. Botulinum toxin is known for this effect and gave its name to this technique known as"Botox". In cosmetics, many products use a reference substance called Argireline™. Other derivatives are now available, of various origins and varying levels of effectiveness. Another mode of action was also proposed. It is to counter an essential property of the dermis which is fibrillar contractility. In this approach, the substances involved interact with the contraction of fibroblasts and collagen fibers to decrease dermocrispation. The most representative products in this class are based on Boswelox™, an active ingredient initially developed by the L'Oréal group (Dermo Expertise). - Biostimulation, which often follows the principles of mesotherapy and relies on concentrates that stimulate the activity of skin cells, mainly but not exclusively the dermis. From this point of view, these substances take up the principle of biological creams with properties of activation of tissue systems involved in the mechanisms of aging. These are activities associated with what is commonly referred to as vitality. These applications include Filorga's NCTF™, Re-Plasty's Cica-solution and Neodermyl™, an active ingredient that has recently been offered and won many awards for its activity. In addition, a non-exhaustive list of substances that can be used in these different functions, based on the Coptis database is annexed to this article . All of these active ingredients are generally offered in vectorized form to improve bioavailability, much like mesotherapy administration techniques that directly address the dermal compartment. Vectorization techniques are therefore widely used in the design of these products. Examples include liposomal forms, biomimetic vectors based on alkyl glycoside surfactants such as Filorga's Chronosphères™, or, more recently, encapsulation techniques derived for example from microfluidics, etc. Moreover, the formulation of excipients is based on the same principles as usual. Finally, the ranges are often developed taking into account the practices specific to non-surgical procedures, but involving interventions in medical offices or cabins. These ranges therefore include preparation products (pre-intervention) or intervention management products (post-intervention). This approach also quite commonly incorporates cosmetic instrumental practices, thus taking into account those of the cabin or the institute. From this point of view, this segment was particularly innovative in very quickly integrating hardware complements to conventional products. Thus, procedures have been introduced that largely include these approaches. It is, for example, light in the form of photomodulation, but also"epidermoporation", a set of techniques to improve the bioavailability of active ingredients, i.e. the absorption of active ingredients by the skin. These include Dermaroller™, radio frequency, electricity and beauty toys whose effectiveness is becoming more and more evident. Finally, beauty routines regularly include care sequences combining all these techniques. In this context, product development will have to take these specificities into account. Without claiming to be a formal definition of this approach, these are the basic principles used by the brands that initially created these provisions. We will regularly review its various aspects, active principles, encapsulation techniques or cosmetic instrumental to clarify their interest and mode of action. An update on the main brands will also be proposed in order to understand this segment more precisely. This list has been established from the Ingredient Coptis database by association of key words defining the function and using only specialties whose indicated properties have been evaluated using specific tests.